What causes discolored teeth and is there any way to cure or prevent staining? 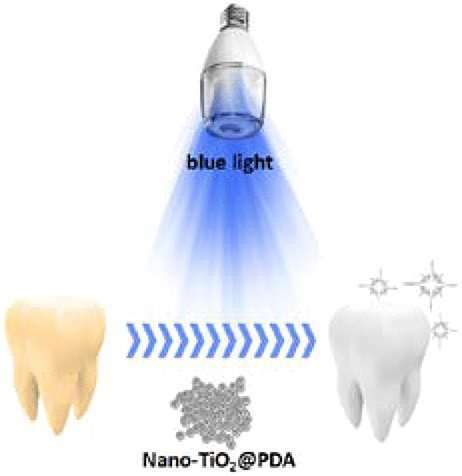 The application of polydopamine (PDA)-modified titanium dioxide nanoparticles (nano-TiO2@PDA) as a new blue-light-activated tooth whitening material was discussed for the first time. Compared with the classical clinical whitening agent (peroxide, hydrogen peroxide, and carbamide peroxide), nano-TiO2@PDA-based treatment not only had a similar whitening effect but also showed remarkably less damage on the enamel structure. Essentially, a highly effective and nondestructive tooth whitening treatment could thus be realized accordingly. The toxicity and antibacterial properties of this material were also evaluated systematically. Video: What is the best way to whiten teeth?